The first Swift Current Broncos game that Stetson Zacharias ever attended was one to remember. 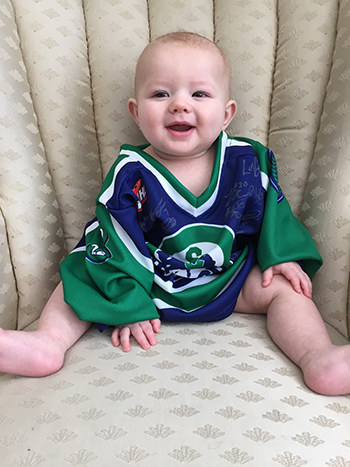 Not that Stetson, the six-month-old son of Shaunavon residents Brianna and Jason Zacharias, will have much of a recollection of the contest which featured the Broncos squaring off against the Medicine Hat Tigers at the Credit Union iPlex on Saturday night (Feb. 28). Stetson was sleeping in his mother’s arms when a puck cleared the glass during the game and struck the toddler in the head. “I got up right away and started walking and the paramedics came up to me instantly to make sure he was okay,” said Brianna. Stetson was rushed to hospital where x-rays showed a small fracture to his skull. Doctors kept Stetson in the hospital overnight before clearing him the next day to return home. Brianna says the family makes an effort to attend a couple of Bronco games each season. “His two older brothers were also at the game with us, but this was Stetson’s first Bronco’s game,” smiled Brianna. There is protective netting at the facility in Swift Current, but it only stretches across both ends of the ice surface. The family was sitting in section A, located near the entrance to the arena, at the edge of the netting. The puck was shot from the centre ice area in the direction of where the Zacharias family was sitting and cleared the glass. “It came at an angle towards us – it was very 0unexpected,” said Brianna. The puck glanced off Brianna’s arm before hitting Stetson, which may have helped soften the blow. Brianna is hopeful that the incident will help create awareness about safety issues at hockey rinks. She would also like to see the protective netting extended throughout the iPlex to prevent incidents like the one involving Stetson. Brianna praised the Broncos for their help during the ordeal. Team officials remained in contact with the family and were concerned about Stetson’s well being. Team representatives also expressed an interest in looking at ways to make the seating area in the arena as safe as possible for spectators. “They were very concerned and it was nice to know that they cared,” said Brianna. Players on the team also got together and presented Stetson with a signed jersey. Brianna said the family was very appreciative of all the support and well-wishes they received from friends and family members last week. Even people sitting with them in the stands showed a great deal of concern about Stetson’s well-being. Along with the jersey, the Broncos also presented the Zacharias family with tickets to a future game. The incident occurred with about two minutes remaining in the second period. A game, by the way, that was ultimately won by the visiting Tigers 5-1.